JFP & Co are a boutique and exclusive business offering customised and specialised services. JFP & Co offer a wide range of commercial and supplementary field support services to a broad range of professional and government sectors. While many business models are shifting to virtual based platforms, JFP & Co are able to provide services for sought-after hands-on field work on an as-needs basis designed specifically to streamline the operations of your businesses or department. Commercial services such as the acquisition of commercial information, collection of all on-site field data, independent verification services along with being able to coordinate independent reports have been designed to further increase efficiencies to your business or department and by using our Independence may assist in compliance. Our preliminary scenario and sample testing can assist in providing a faster and more cost effective method to establish if further specialist experts are required in a wide range of areas. 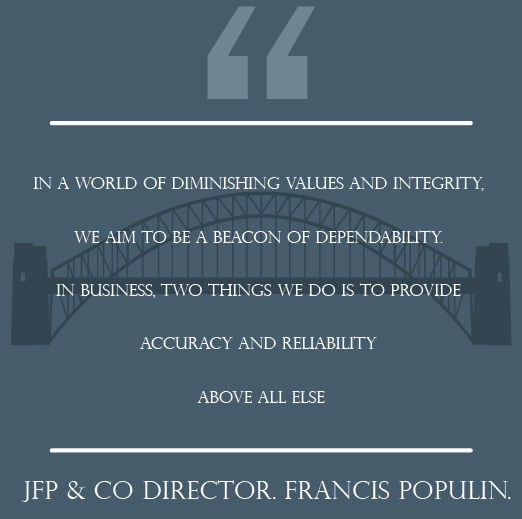 JFP & Co is a dynamic business that prides itself on delivering the highest professional standards. Our team is made up from a diverse range of professional and trade backgrounds spanning various qualifications. The company has a culture rich in common sense and high professional standards. We operate with total independence and a non-bias agenda with the sole intention of providing you with access to more information on demand. 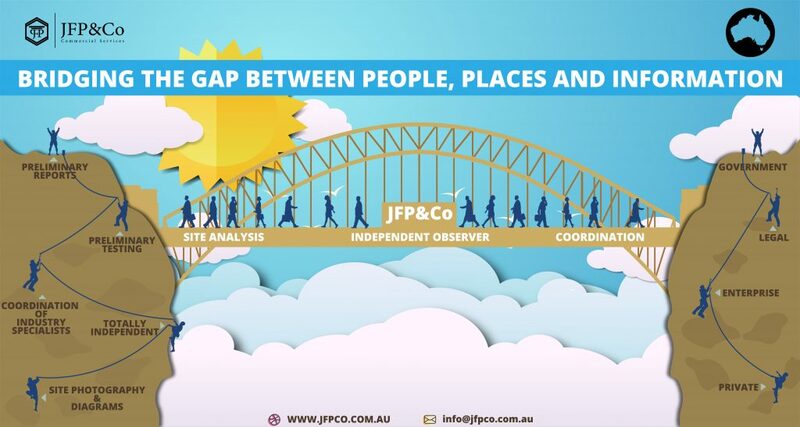 JFP & Co are currently located on the Gold Coast and Brisbane and are also providing limited services in Melbourne. Expansion for full feature services to Melbourne and Sydney are imminent, to accommodate the ongoing requests for our services. Our representatives will travel to almost any location should this be required. We are also available for any specialised and / or confidential project based roles. Feel free to contact us to find out more about how our wide range of services can work for you. Outside business hours by prior arrangement only. Additional fees and charges may apply.